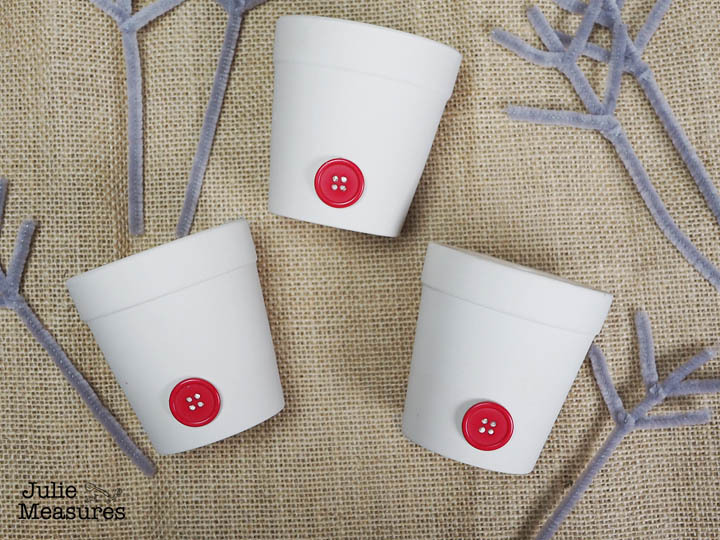 Rudolph is delivering tiny clay pots full of goodies! 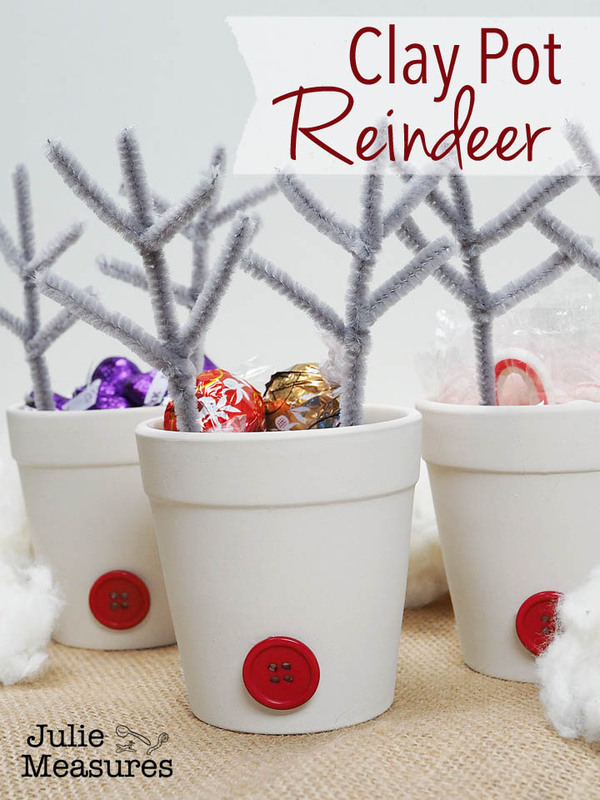 See how easy it is to make a whole bunch of Clay Pot Reindeer. 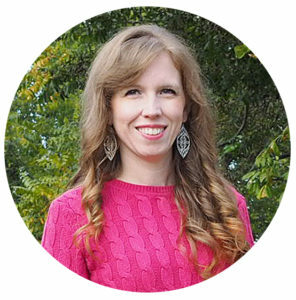 As soon as Thanksgiving was over my house and car were overtaken with Christmas music. Littlest, in particular, has been really excited about holiday music this year. He definitely has his favorites including Jingle Bells, Deck the Halls, and Rudolph the Red Nosed Reindeer. When we sing Rudolph we also include the bit at the beginning, “you know Dasher and Dancer and Prancer and Vixen, Comet and Cupid and Donner and Blitzen.” He was so proud of himself when he remembered all of the reindeer names. Of course we do know who the most famous reindeer of all is, Rudolph. While I haven’t kept the tradition of swapping plates of homemade treats, I do still love to deliver goodies to friends. 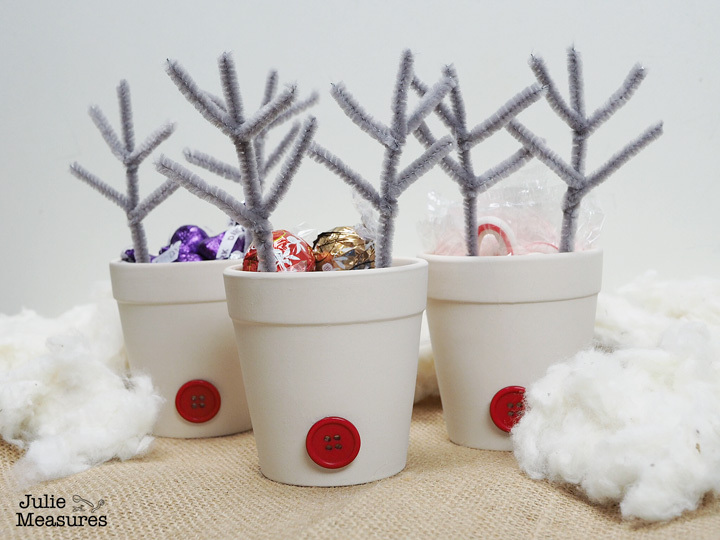 A little terracotta pot full of sweets is the perfect size to hand out to teachers, friends, and neighbors. 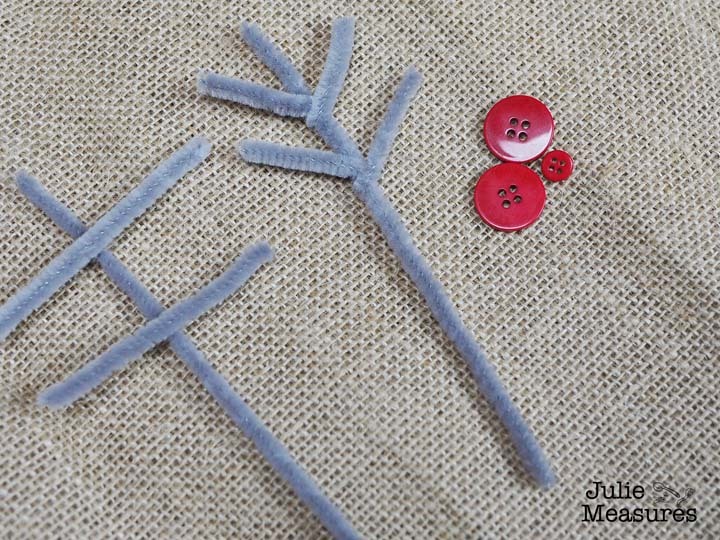 The first step is to make the antlers using pipe cleaners. For each antler you need one longer piece and two short pieces. I cut one pipe cleaner in half to make the two longer sections. 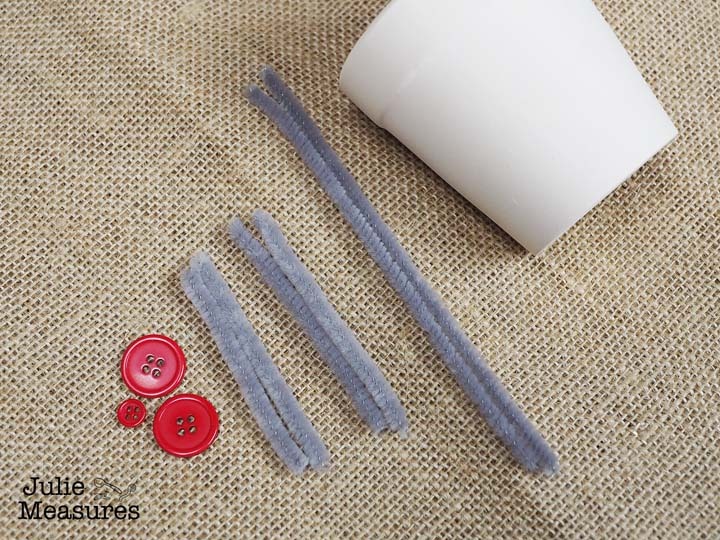 Cutting a pipe cleaner into fourths was a good length for the shorter pieces. Twist the two shorter pieces around the one longer piece to form each antler. Each clay pot reindeer with need two antlers. After I made the antlers I placed the red noses on my clay pots. 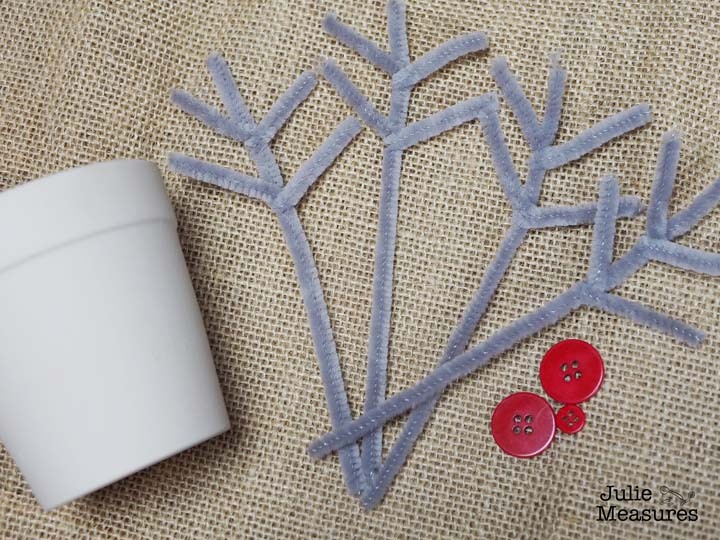 I used red buttons but you could also use small red pom-poms. Hot glue the noses into place. 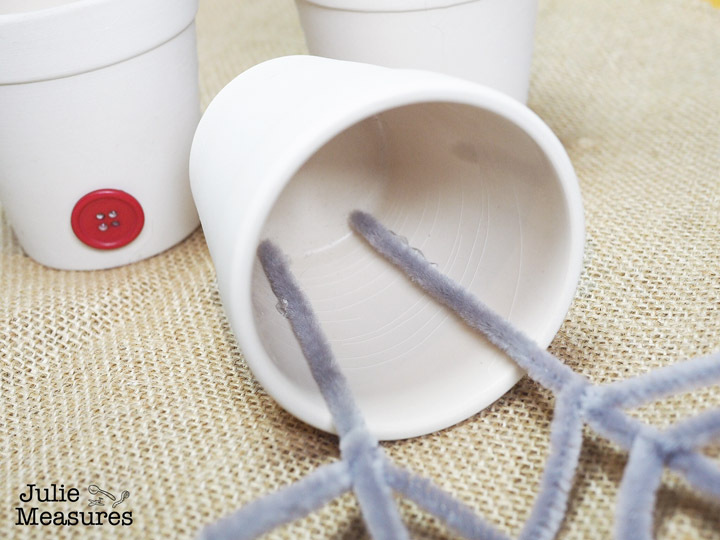 With the noses on the front, I hot glued the pipe cleaner antlers to the inside of the clay pots. That’s it! Your terracotta reindeer are finished. The last thing I did was to fill up each clay pot reindeer with sweets to give to friends and teachers. 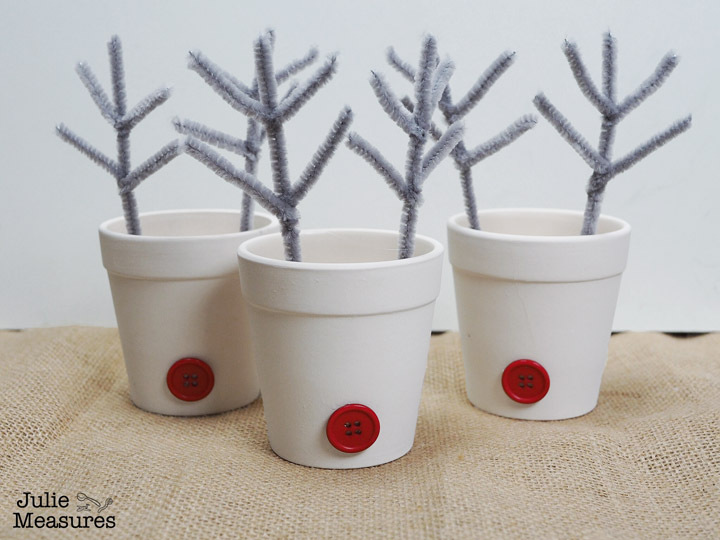 Go deliver some holiday cheer with these simple Clay Pot Reindeer! Want more reindeer holiday ideas? Make these fun Reindeer Donuts!